I love that I have a job where I can help people capture the feeling of a time, which we all know too well, inevitably will slip away. I feel like a time traveler and it’s awesome. Now those who love, and will come to love Alex, will always remember him as a fun loving kid, with all his innocent, exuberant charm, whenever they see this lovingly rendered charcoal drawing on the wall. His mom was so happy when she saw this that she cried and hugged me. That’s what all this is about. Not the accolades, the awards, the kind words, the “likes.” It’s about love. And if that sounds sappy or overly dramatic to you, then go hang with the other stoics, who take pride in cynicism and despair. I think love is way too cool for school. 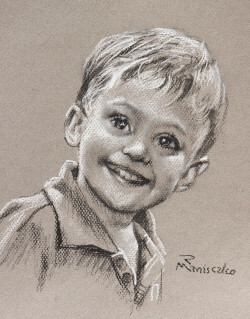 Have a Charcoal Portrait of Your Child for less than you ever thought possible – Now for a limited time only. I Don’t know why my post says, “Database Error.” Let me know if you are not able to open the link to this blog.